Edinburgh winger Tim Visser, preparing for what may prove his last match for the club after a six-year spell at Murrayfield, feared a change of coach would yield disastrous consequences. Head coach Alan Solomons' signed a year-long extension on Thursday. "Alan's been instrumental," said the Scotland international, who joins Harlequins next season. "He came in at a time when Edinburgh was a real mess. He's created a lot of stability." Under South African Solomons' more pragmatic, forwards-focused strategy, Visser has found himself enjoying less attacking ball. The transition was testing for a prolific finisher who has topped the Pro12 try-scoring charts four times, and admits it was "a small factor" in his decision to leave Edinburgh. "He's given us a real purpose and a real direction," said Visser. "His approach to the game has been very clear in how he wants us to play, which at the start was probably something some of the players questioned, but everyone's really bought into it over the last season. "Changing coach at this point would be catastrophic, I'd say. Scott says the retention of Alan Solomons is "crucial"
"When I first came to the club, we had some fantastic attacking players and we could score tries from everywhere. But we couldn't defend if our lives depended on it. "I used to be very attacking-focused and score a lot of tries, and now a lot of my work comes in defence and making sure the backfield is covered, and chasing kicks, because we kick a lot. "It has been a bit frustrating. If I can't score tries then I sometimes struggle to stand out as a player. It's great to become a better all-round player but some sort of balance would be good. "Part of it is about becoming part of a team that does try to play a bit more rugby, and Harlequins' ethos is very distinct in that they'd rather play the game they want to play than win. They massively believe in how they approach the game." 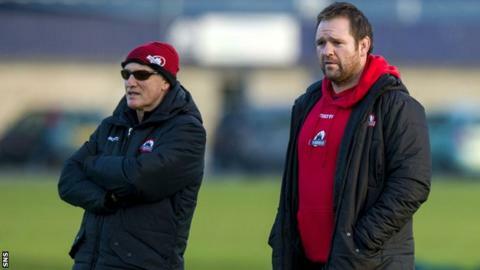 Edinburgh assistant coach Steve Scott says he has not been approached by any disgruntled players over apparent friction between the squad and departing managing director, David Davies. Davies announced his resignation on Saturday citing "unhelpful media speculation". "I've not seen any problem with the players coming to me with any issues," Scott told BBC Scotland. "My work's just been as normal." Boardroom turbulence is especially unwelcome in the capital as Edinburgh host Leinster in the last round of Pro12 fixtures on Saturday with a win imperative to keep their hopes of Champions Cup qualification alive. "I think Alan had a plan for this place, to develop youngsters and to get the team winning," added Scott. "He said it would take three or four years to do that. "It's certainly going in the right direction, the team has got a lot of improvements to do but it's crucial Alan is staying on for a further year. "Edinburgh's had a lot of good players throughout professional rugby, but it needed a really strong coach. "Alan's had a lot of experience; he's been coaching 30-odd years so he's been around the block. He knows what to do to pull a team together."